PRESIDENT URIBE: (Via interpreter) The United States and Colombia, our Colombian Ambassador Carolina Barco in the United States, Mr. Foreign Minister Jaime Bermudez, very distinguished delegates that are accompanying the Secretary of State, distinguished journalists – Madam Secretary of State, welcome to Colombia. We Colombians welcome you with great affection, admiration, and appreciation. 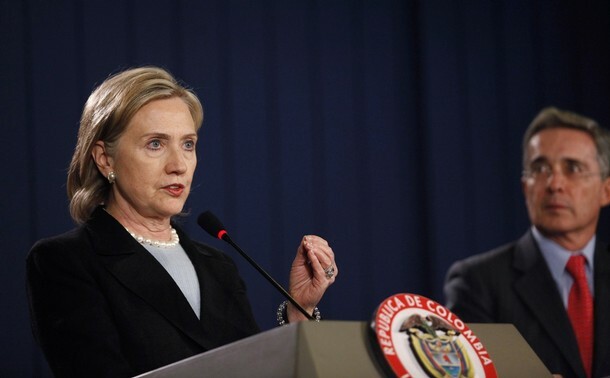 President Clinton, you and your family have always expressed, have always shown a great love for Colombia. In Colombia, you have sown affection and you reap affection. That is why we receive you here, welcome you here with great love, with great gratitude. You have helped us continuously. I remember in the first days of our administration, I had an opportunity to visit you at the U.S. Senate in your office, where you gave us a very public and a very firm support, speaking of Colombia’s democratic policy. And as Secretary of State of the United States, we have always had your support. The United States is a great ally of Colombia. In 200 years of independence, Colombia has only had 47 years of peace. The living generations today, those born in the 1940s, have not had a single day of peace. The violent conflict between our parties, the violence between the Marxist guerrillas, the equally cruel, violent of the paramilitary forces, the drug trafficking that co-opted all of them, all of that has created this very grave list of violent actors in Colombia. The United States’ decision, a practical decision, to support Colombia has been very useful. 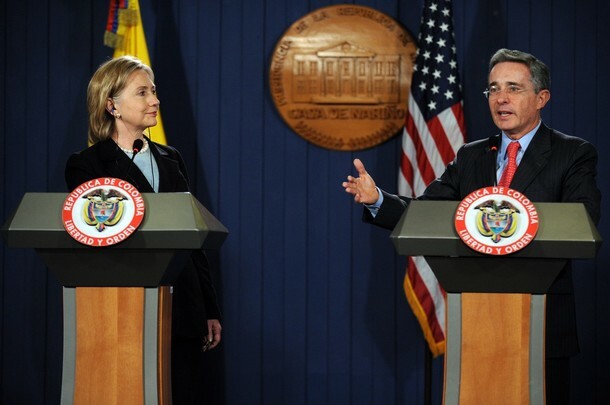 President Clinton signed and implemented Plan Colombia with my predecessor, President Pastrana. It was a great step forward in the war on narco-terrorism. President Bush gave us all of the support that we needed. And this plan continues with the same strength under President Obama’s Administration. We have witnessed a bipartisan political approach from the United States toward Colombia. President Bush, Sr., launched the Tariff Trade Preferences Act, which was extended under President Clinton, and these are policies which continue today. Thank you very much for this visit, for this new show of support toward Colombia. Colombia is not yet a paradise; however, we are gaining ground. This battle is winnable. That is why we cannot cease. We have lots of problems to address before us, but lots of progress has been made. On the 7th of August 2002, the terrorists launched explosives against this seat of government. On an adjacent street, 24 Colombians were murdered and more than 40 were seriously injured. Terrorists used to murder presidential candidates. Throughout all of these years of democratic security, Colombia has regained its political freedoms, which had not been lost due to actions of governments. All the governments have been respectful of democracy. They were being lost due to the terrorism. The armed forces, the citizens, in total respect for the constitution have recovered their political freedoms for our compatriots. The electoral processes in 2003, 2006, as well as the current one, have shown how this country has recovered security for political freedoms. An English observer, Madam Secretary of State, was here recently and he told me that in 2002, when I told him, when I explained to a British delegation about our democratic security policy that we planned to implement, he did not believe in it. He said that’s impossible; it is impossible for a Colombian Government to be successful in its security policy while having full respect for freedom. Recently, he was here and he has admitted that it was possible. This policy has a lot more ground to cover yet. I say that it is only a kernel, a seed, but this policy has some very favorable elements in its favor. We have a monopoly on justice. We have a monopoly on the armed forces by dismantling the paramilitary forces. All mayors and governors in Colombia are protected without respect to their political origins. Four hundred of the 1,200 mayors previously in Colombia could not carry out their local functions because of terrorism. We have implemented this policy through our normal legislation, by respecting civil rights with political guarantees, without martial law. When there have been violations of human rights, the armed forces themselves, the ministers of defense, the president, we have not hesitated in taking the most drastic action. In a country that has suffered so much due to terrorism, there is only one path ahead of it – the constitution and the protection offered by the armed forces. Last Saturday, and this is a harbinger of your visit, Madam Secretary of State, the International Labor Organization has removed Colombia from the list of sanctioned countries. For many years, Colombia was on that ILO list. In the last two years, Colombia was on that list with the mitigating comment attached to it that it was a country that was making progress. Now, we have been completely removed from that list. Our work toward effective security is as important as is our devotion to freedom, toward respect for the constitution, toward human rights. We have fought a valiant war against narco-terrorism. And there is a common element here in all human rights violations in Colombia. We see the presence of drug trafficking, which we have been severely reducing. Our country during 14 years also made the mistake of legalizing drug use. And it was very difficult when you have freedom of drug use in a country that produces drugs, with all of its criminality; it was very difficult to combat the criminal element. After many actions, the law was approved. For those who are sick, they get treatment. For those who are young – for the young, they get prevention. It is a public policy based on public health, based on prevention, on rehabilitation, but for criminals, the full force of the law. Colombia has made great efforts, tremendous efforts in combating drug production, trafficking, and now against drug use also. In countries like Colombia and the countries of South America, one cannot say that the drug problem is a problem because the industrialized countries use drugs. Our countries now also have serious drug use problems. That is why this problem at all of its stages is a problem for all. In recent years, we have decided to build confidence in Colombia. That has been our guiding word: confidence, trust based on three pillars of democratic institutions, on investment, and on the advancement of social policies. This morning, I was saying to some members of the media that were here (inaudible) that the best PR for confidence in Colombia is that last night, the Madam Secretary of State of the United States and the president, Bill Clinton, were in a restaurant in Bogota with complete peace of mind enjoying this beautiful city and its good restaurants. Some years ago, because of terrorism, this would have been unthinkable. Your visit, the fact that you spent the night in Bogota, the frequent visits by President Clinton, those are a great show of confidence in Colombia and the fact that one can have confidence in Colombia. I want to thank you and thank the people of the United States through you; also my appreciation for the executive branch, for President Obama, for the support that my administration has enjoyed these eight years. There is a large task to be completed ahead, but I think that we have a very good start. 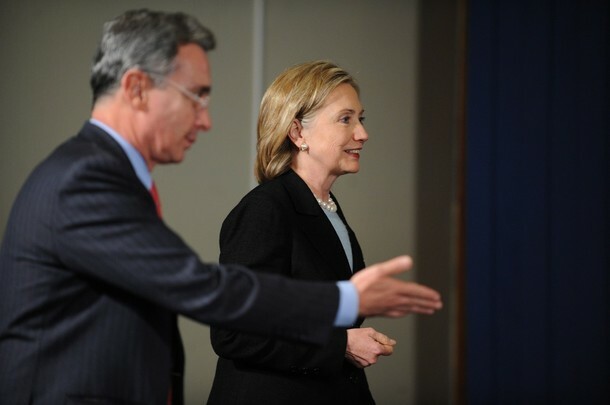 Madam Secretary of State, welcome. We welcome you here with great gratitude. 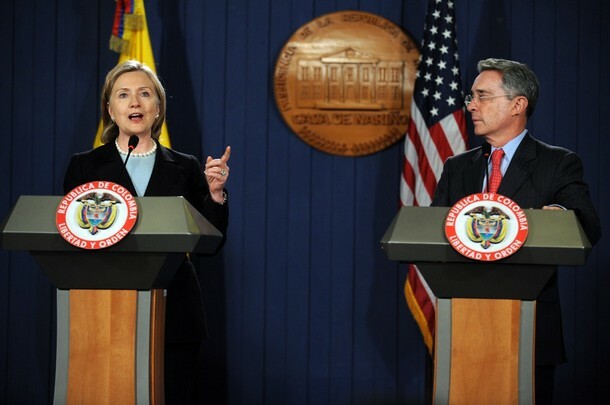 SECRETARY CLINTON: President Uribe, let me begin by telling you how pleased I am to be here in Colombia for the first time. You have been so gracious in entertaining my husband and my daughter in the past. And now, I finally have completed the family visits to your beautiful country. This is a trip I have looked forward to making for quite some time, and it is a real pleasure to see how far Colombia has come and how much Colombia is contributing not only to its own people but to those who face similar struggles beyond your borders. So thank you for your hospitality, thank you for the very comprehensive discussion that we have had together today, and for the opportunity to reaffirm the friendship and strong partnership between the United States and Colombia. In the last decade, Colombia has confronted immense challenges. And by any fair measure, Colombia has made great progress. That is thanks to the leadership of your government and to the resilience and dedication of the Colombian people. And even with continuing challenges in your own struggle, Colombia is playing a positive and increasingly important regional role, whether it be on promoting clean energy or on relief and recovery efforts in Haiti. The United States has been proud to stand with Colombia, and we will continue to stand with you in the future. President Uribe and I discussed Colombia’s continuing efforts in the fight against drug trafficking and organized crime. And I expressed the commitment of the Obama Administration to continuing to partner with Colombia as it works to consolidate the security gains of recent years. We also discussed Colombia’s efforts to enhance human rights, the strides made, the challenges that remain, the ongoing need for vigilance and commitment. And I also want to publicly express our admiration for President Uribe providing a remarkable example of strong democratic leadership in respecting the constitutional court’s decision regarding another term. Colombia is such a valued partner and a leader that we look forward to expanding and deepening our partnership. Colombia has helped to lead the way as an active member of the Energy and Climate Partnership of the Americas. Just a few examples that we look to and encourage others to do so as well: developing cutting-edge mass transit systems, exploiting the potential of biofuels, becoming a leader in the use of ethanol, spearheading an initiative to help build the infrastructure for long-distance electrical transmissions from Panama, through the Andean states, to Chile. Colombia has also worked hard to address the historic lack of opportunity for many of its people, and in doing so has provided important models for other countries in our hemisphere. Recently, the United States and Colombia concluded the first steering committee meeting for our action plan on racial and ethnic equality, which will work to improve access to education, employment, and other opportunities for Afro-Colombian and indigenous communities. We signed a new science and technology agreement today that will facilitate the exchange of ideas and technology to help both our countries compete in the global economy. All these and many other efforts speak to the enduring bonds of friendship and the stronger partnership for the future that we have, not just between our governments but between our peoples. Mr. President, I speak for President Obama and myself when I say that you, personally, have been an essential partner to the United States. And because of your commitment to building strong democratic institutions here in Colombia and to nurturing the bonds of friendship between our two countries, you leave a legacy of great progress that will be viewed in historic terms. I know, though, as you said yourself in your remarks here today, you realize how much more is yet to be done. This morning, I met with the two remaining presidential candidates. This is a choice for the Colombian people to make, but I have to say that the first round of voting was a testament to the vibrancy and strength of Colombia’s democracy. And the United States will work closely and constructively with whomever the Colombian people choose in this second round. So thank you once again, Mr. President. And you’re right; we had a wonderful dinner last night here in Bogota among friends, some Colombian, some American. And we talked about how remarkable it was that such a common event could take place. And as I drove here to the presidential palace and had the chance to look out the window at this absolutely magnificent city, my heart was filled with the hope that I know fills the hearts of so many Colombians, that what has been accomplished will only go from strength to strength. We will stand with the people of Colombia to make that so. MODERATOR: Next we have four questions. They have been selected by the international and national press. Mr. Carmichael of AFP. 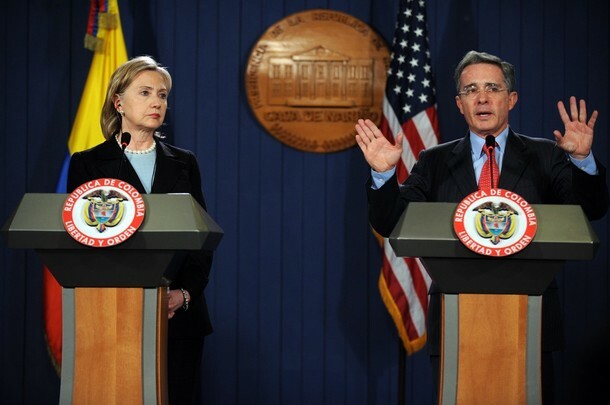 QUESTION: Madam Secretary (inaudible) more specific about the commitments the Obama Administration is going to make to reassure the Colombians about the threat coming from Venezuela, and also in dealing with its domestic threats, the FARC and the narco-traffickers? And just another question for both of you: Given the fact that there is a political transition underway, what assurances can you make publicly that the momentum towards improving human rights will not be lost? SECRETARY CLINTON: Well, let me respond first. There is no doubt that the bipartisan commitment of the United States Government to Plan Colombia has been an essential part of the success that the Colombian people and this government have achieved. We are very gratified by what has been accomplished. But the president and I discussed the remaining agenda. The security threats have not completely been eliminated and, therefore, the United States will continue to support the Colombian people, the Colombian military, and their government in the ongoing struggle against the insurgents, the guerillas, the narco-traffickers, who would wish to turn the clock back. We believe that progress has occurred and is strongly established, but there is no resting until the job is done. At the same time, the United States is moving to assist Colombia in its aspirations for greater social, economic development. I had a chance to briefly speak with some of these ministers who have been working on a range of issues that affect the well-being of the Colombian people, particularly the poor and marginalized. And there is a great commitment in this government that I have every reason to believe that will continue into the next government, whoever is the victor in the run-off election, to not only to consolidate the security gains but to deliver results to people who have made a very big commitment to democracy and peace. So we are prepared to support the people of Colombia and the government that they choose, and we are very confident that the ongoing commitments that have been articulated by this outgoing government will be carried on by the incoming government. PRESIDENT URIBE: (Via interpreter) For Colombians and for the government, the security that this country needs, needs to be sustainable, and is – and it is sustainable to the degree that there is credibility. That credibility lies in its effectiveness and in its compliance with transparency, with human rights. Whenever there is a violation of human rights in Colombia, that violation is punished. The armed forces have fulfilled their honorable task. The armed forces, the ministers of defense, and the presidency, without any hesitation, have punished any human right violation. Citizens today feel much more trust. They – today, they denounce these crimes. They used to fear doing so. Victims before did not denounce these crimes because they feared vengeance or because they felt it was useless to do so. Today, we have registered more than 300,000 victims. Colombia is making a lot of efforts in terms of compensation. There is no such thing as total compensation, but we are aware that when we advance with compensation, that makes it so that we can eliminate the spirit of vengeance, so that we can eliminate hatred, so that we can create a path toward reconciliation. On many occasions, on our idea of having a government to have a lot of space for public opinion, to have opinion be a part of the rule of law, the minister of defense, the high command of the police, and myself as president, in that spirit we, on television, are willing to – have received, in fact, complaints from our countrymen on human rights. 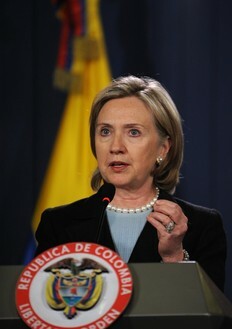 It is important to say that, just as we have had false positives – human rights violations that have been punished, there are also uncounted numbers of false accusations because those who thought that terrorism would triumph in Colombia, they chose the path of discrediting this policy without fighting it head-on, so that this policy would not move forward. A few days ago, along with the minister of defense, I was at the UN offices here in Bogota. Since 1994, Colombia has had a delegation here from the UN high commissioner on human rights present. Then, at that office, a protected witness said that these human rights violations that we call false positives were actually cases that were related to infiltration by drug traffickers within the armed forces, which is marginal but very serious – what has been severely punished. And that has been done, thanks to the fact that we are definitively winning against narco-terrorism, which has caused so much harm in our country. A few days ago, the United Nations also told me that in the last year-and-a-half, they had received only four human rights complaints, that they were pleased with that result. And I told them the government is not pleased because we want zero cases. But that also shows that all measures that have been taken by this government in terms of human rights are measures that are creating results. We reiterate our commitment, our commitment which is today felt within the souls of most Colombians, of having a security policy with democratic freedom, with a strict observance of the constitution. I believe that in order to speak of human rights in Colombia, one must look at this election. We have candidates from the entirety of the ideological spectrum and they have traveled throughout the country. They have said anything they want to say. They have visited anyplace in this country that they want to visit and there have been no limitations imposed on them because they are protected by these guarantees. These are political guarantees, and those are called human rights, civil rights, political rights. The country is making progress in all of these areas. And the help of the United States is very important. The help of the United States has been not based on rhetoric; it’s been a practical help. If anything has changed as far as foreign policy in Colombia under my administration, it is that before, we settled for a pat on the back or condolences on our shoulders; today, we will not – today, we do not allow protection of terrorism anywhere within our territory. And we always show this example of the practical, not rhetoric, the assistance that the U.S. has given to Colombia. And Colombia, which has been an ally, a faithful ally of the United States, expects to continue with that alliance which is so useful for new generations of Colombians. We want new generations to feel confidence, to feel happiness in Colombia, that they can exercise their freedom to leave this country to study, to gain experience, but they should not leave this country run out by violence. To create confidence in these new generations is critical, and the United States’ contribution helps a lot in that sense. That is why Plan Colombia, that is why the cooperation agreement on security which was recently signed with the United States, is so transparent. Madam Secretary, one time discussing this issue with President Lula in Brazil, the foreign minister and I said to him, “President, this agreement has been done in such good faith that we’re sending you the text.” We had no doubt in doing so. We published the text openly. It was published in internet — on the internet, it was sent to all the foreign ministries. It’s an agreement that helps us greatly in this war on terrorism, which has caused us so much harm. MODERATOR: Felipe Arias from RCN Television, next question. QUESTION: Madam Secretary, good afternoon. Welcome to Colombia. Mr. President. I would like to ask you, you’ve made great efforts here by President Uribe in recent years to achieve the signing of the FTA with the United States. Can we expect more decisive support from the Obama Administration in order to get the signing of the FTA in the upcoming months? And I don’t know if I could ask President Uribe after that on another topic. May I? Very well. Mr. President, what is your response to the issue of the recent sentencing of Colonel Alfonso Plazas Vega? SECRETARY CLINTON: Well, first, let me underscore President Obama’s and my commitment to the Free Trade Agreement. We are going to continue to work to obtain the votes in the Congress to be able to pass it. We think it is strongly in the interests of both Colombia and the United States. And I return to Washington very invigorated by the dialogue that we have had and the questions and answers that we have shared to work with your ambassador, who does an excellent job for you in Washington, and your trade minister and foreign minister and others, to begin a very intensive effort to try to obtain the votes to get the Free Trade Agreement finally ratified. PRESIDENT URIBE: (Via interpreter) This event took place in 1985. 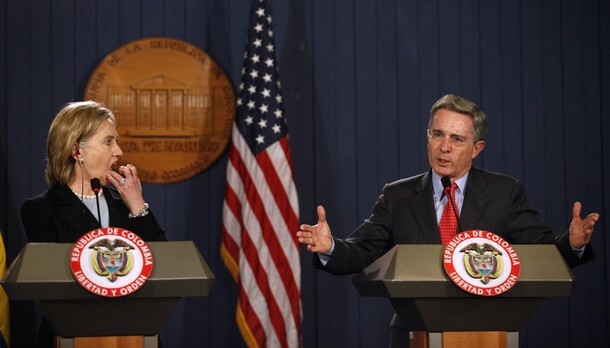 PRESIDENT URIBE: No, I was unaware of the news of the sentencing. This is something that took place in 1985. This was a criminal alliance between drug traffickers and guerrillas that murdered a supreme court of justice. The – none of the criminals are in jail. And now I see that a member of the armed forces of Colombia has been convicted, someone who was simply trying to fulfill their duty. That hurts. That makes me sad. MODERATOR: Next question, from Mark Landler of New York Times. QUESTION: Thank you very much. Mr. President, I ask your indulgence to address a question to the Secretary of State on news outside of Colombia, if I could. Madam Secretary, Senator McCain said in the wake of today’s Security Council vote that Congress should move immediately toward passing a stronger set of unilateral American sanctions against Iran. If such a measure were passed, would the President – the Obama Administration, swiftly sign and implement it? And then if I may ask one follow-up, now that the Iran resolution has been passed, does the United States plan to push the Security Council to move quickly on a resolution condemning North Korea for the torpedoing of the South Korean ship? Thank you. 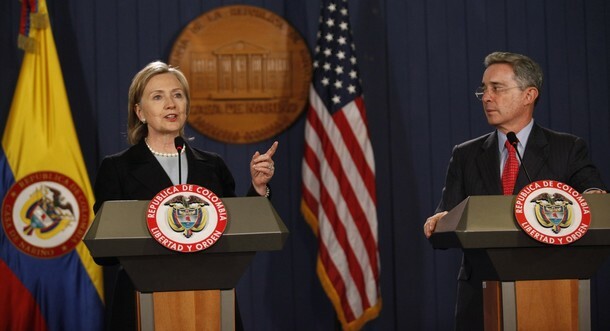 SECRETARY CLINTON: Well, Mark, we were very pleased by the action in the Security Council. These were the most significant sanctions that have been imposed on Iran. Iran worked very, very hard to avoid the large vote in favor of these sanctions. And the fact that we were successful in achieving such a show of unity in the face of Iran’s continuing obstructionism was a good day for the international community, the rule of law, and the overall goal that we share with so many around the world to prevent Iran from obtaining nuclear weapons. This is a very important step, but it is just a step in our efforts to dissuade Iran from pursuing a non-peaceful nuclear program. I have today appointed Bob Einhorn, our senior advisor on nonproliferation issues, to head up a government-wide effort to implement these sanctions coming out of the United Nations. And as you know, the Congress has been working on its own legislation for many months. I look forward to consulting with the Congress on their intentions and working with them. There may likely be other entities, unilateral or multilateral, that will similarly take a look at the action today and determine what else is necessary. But I think it’s important to recognize the significance of what happened today. And we certainly appreciate the extraordinarily hard work of many of our partners around the world, including Turkey and Brazil, which ultimately decided they could not support the sanctions but have been working very hard for many months to achieve the same goal that we all share: preventing Iran from developing nuclear weapons. And we look forward to working with our P-5+1 partners, as well as any others who share the goal, understand the urgency of it, and are prepared both to enforce sanctions that will undermine and prevent Iran from pursuing nuclear weapons, but try to reopen the door to diplomacy and negotiation. Now with respect to your final question, I think I’ll take a breather here, Mark, and just talk about one heavy lift at a time. And we are very pleased by what happened today, but of course, we continue to express our concern about what happened to the South Korean ship, the Cheonan. And we support the efforts of South Korea to try to obtain satisfactory action in the Security Council in the future. MODERATOR: Last question by Marcelo Uchoa from Caracol News. 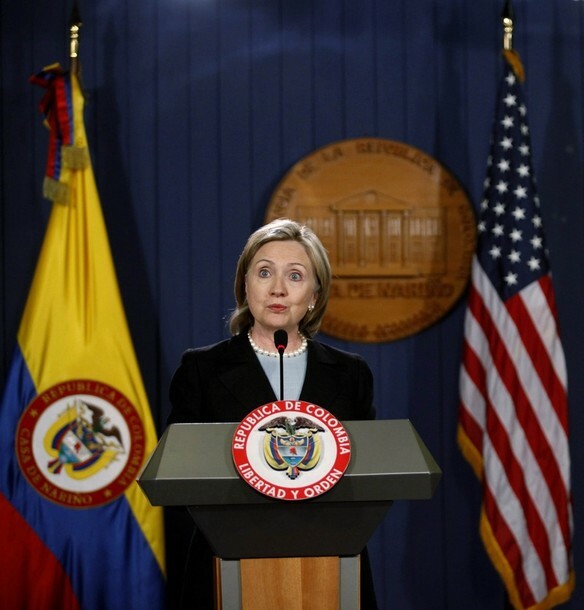 QUESTION: (Via interpreter) Good afternoon, Madam Secretary of State. I would like to ask you – you mentioned a concrete commitment from the U.S. toward Colombia in terms of security. I would like for you to tell us exactly what concrete commitments are there that you’ve established with President Uribe. Also, I would like you to elaborate a little bit more on your answer as far as Venezuela. You said that Colombia still has its threats. Does the United States feel that Venezuela is a threat to Colombia? SECRETARY CLINTON: Well, there has been a reaffirmation of existing commitments that were in place when the Obama Administration took office. And there has been a new commitment that was recently signed, as the president mentioned, concerning the support that we will continue to provide Colombia’s military. In addition, we are looking to increase our aid for social and economic development, for clean energy development, for climate change mitigation, and in many other areas. So the strong commitment to Colombia that Plan Colombia represented when my husband proposed and signed it, which was carried forward in the last administration, is embraced fully by President Obama and our Administration with the additional element of looking to assist Colombia in its desire to provide for more social and economic development. We are very supportive of the security needs that Colombia still has, but we also agree with President Uribe and his council of ministers that democracy has to deliver results for people. So more education, more health care, more roads – these are all tangible benefits that can be distributed around the country that will really give a positive impact to the people of Colombia for the commitment that they have made to democracy and, as the president said, to an electoral process that was extraordinarily smooth in every aspect. I’m here to talk about Colombia and our relationship with Colombia. Colombia is the best judge of the threats it faces and the way that wishes to go about meeting those threats. But I want to underscore for anyone who is listening or watching that the United States will stay a strong partner with Colombia in meeting the security needs that Colombia faces. And we’ll build on the success of the last years as we look toward a future of even greater sustainable peace, progress, and prosperity for the people of this beautiful country. 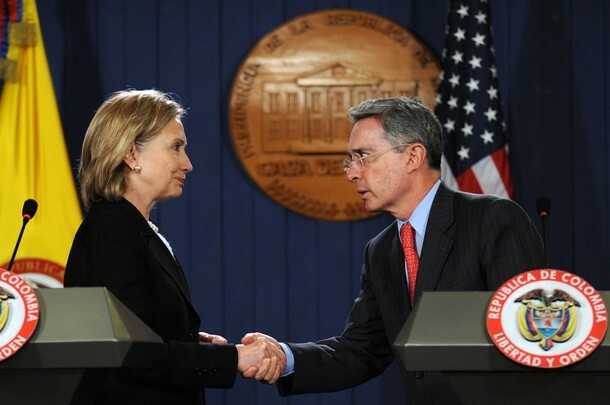 PRESIDENT URIBE: Thank you very much. Good afternoon, Madam Secretary. You’ve been very kind, thank you. Mr. President, thank you.